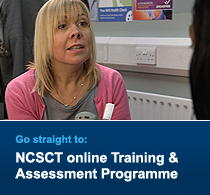 The NCSCT online training is a unique resource that allows stop smoking practitioners to demonstrate that they have core knowledge and skills to deliver effective behavioural support. 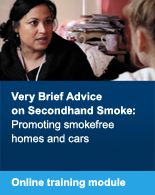 We would encourage anybody who helps smokers to quit to register with the NCSCT, use the online training programme and take the practitioner assessment to achieve NCSCT certification. Having revised the training programme your knowledge and skills will be tested in the practitioner assessment which is made up of a further 24 multiple choice questions and must be passed with at least 70%. 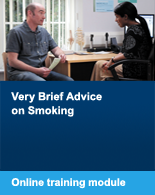 Once passed your name will appear on the certified practitioner list on our website and you will be eligible to take the Smoking in Pregnancy and the Post-Partum Period and Smoking and Mental Health specialty modules. Note: our online training and assessment programme covers the core knowledge and skills and so should not be perceived as conferring expert status. 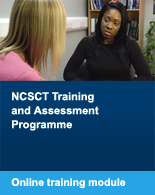 Our national training needs to be complemented by local training and for practitioners to be effective they must also, in addition to being NCSCT certified, observe an experienced practitioner before seeing clients, be observed themselves and receive regular support and supervision. They should also engage in continuing professional development activities and ensure that a minimum number of clients are seen a year to maintain their knowledge and skills.